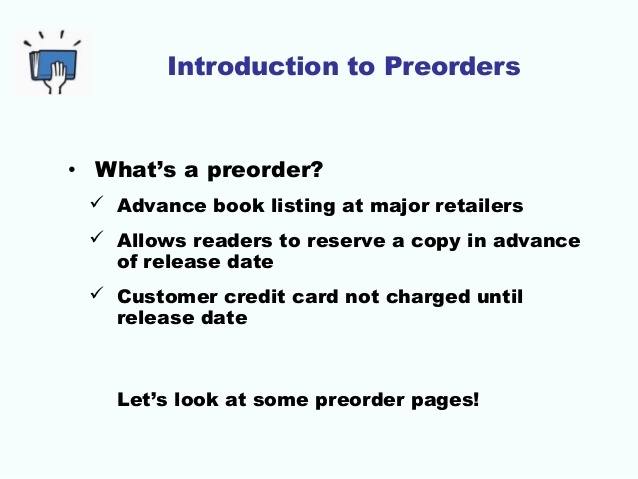 Why My First Experience with Using #Pre-Orders Will Help Get My NEXT #Ebook Higher on #Best-Seller Lists | Sally Ember, Ed.D. 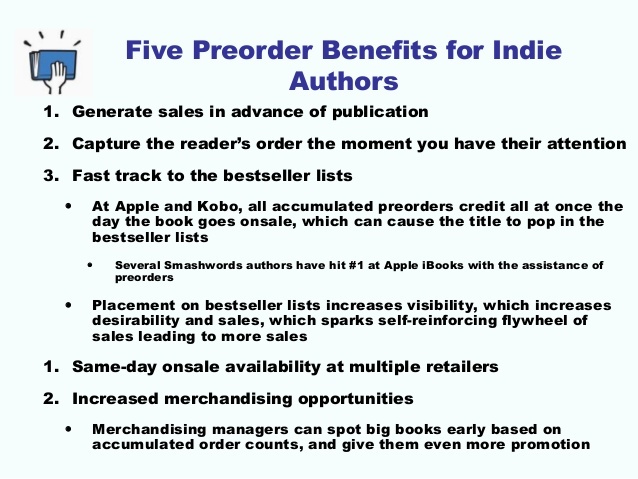 Thanks to Mark Coker, Founder/CEO of #Smashwords, #indie #authors have lots of information in FREE slide shows and several webinars to help indie ebook authors succeed in self-publishing. Mark provided excellent instructions, tips and support for my first ebook’s publication last fall, the sci-fi/romance which has been getting great reviews, This Changes Everything, Volume I, The Spanners Series, including persuading me to engage in a “Pre-order” period prior to full sales release. So, how did my first experience with pre-orders go? This was my first time as any kind of book marketer, but luckily (? ), I was laid off in August, 2013, which gave me family support (thanks, Ellen Fleischmann, Merlyn Ember, Sarah Miranda, Lauri Stern and Carole Harris) to move my unpublished book forward into self-publication. I began immediately to learn, via Mark Coker’s and others’ Google Hangouts, free webinars, blog posts, groups’ posts and articles, all about the publication and marketing processes for indie authors. I did it ALL, except pay for PR (no extra funds): I started a new website and blog; I became active on Goodreads and Twitter; I opened Pinterest Boards; I became more active on Facebook, both on my personal and Series pages; I became more active on LinkedIn; I joined Google+ and began to use it more. 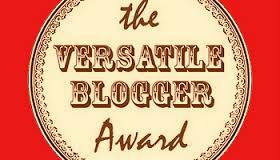 I joined many Groups/Communities on Facebook, LinkedIn, and Google+ as well as Goodreads. I engaged a professional cover artist (thanks, Willowraven!) and started tracking my KLOUT, SNAP and ALEXA scores. I had OUTSTANDING results (I thought) in the first few months, bringing my KLOUT score from 31 to 61 by release day (12/19/13) and my website went from no ranking at all to being in the top 3.5 million via ALEXA. I gave up on Snap. 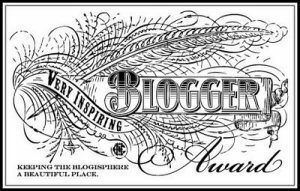 My Twitter #FF went from 7 to over 1600; my blog gained almost 40 #FF (NOT my family, either!). I had almost 300 LIKES on my FB Series page and over 300 contacts personally there and on LinkedIn and Goodreads. 60 were #FF on Pinterest. Seemed good, to me. I also worked hard networking on Wattpad, Goodreads, and Authonomy as well as the above groups and individuals’ websites to garner several very positive pre-sales day reviews which were posted on/into my front matter, my website, Goodreads and all other social media. I joined Shelfari and BookLikes, Authors’ Database and other sites with author and then book pages. I created and updated my Author’s book page on Amazon (which doesn’t do Pre-orders, but I already had a nonfiction book authorship, so I could do this prior to uploading my ebook). 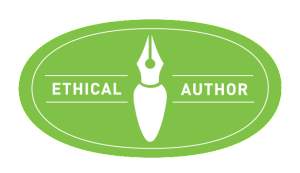 I provided copy for and linked to postings of several author interviews on several websites and BlogTalkRadio’s IndieBooks show. I gave public readings and then videoed myself doing them and posted these on youtube, to start my Series’ Channel. Using the Cover, I printed up 50 flyers (second time I spent money on this endeavor, first being the cover) and gave them out everywhere I went (which wasn’t many places, but I tried!). I talked it up everywhere I went, also. I sent out FB and GR reminders of the release date and planned an Author Q & A on Google Hangout and Goodreads for release day as an “EVENT,” which I extensively promoted, along with the pre-orders themselves, for weeks prior to sales date. I believe I did everything I could to create a strong “Author Platform.” But, being a new author to sci-fi/romance and to ebooks, and an indie, self-published author in a very crowded field, the “splash” I was making, despite KLOUT’s encouraging stats, was not feeling large. Furthermore, I had no way to gauge the success of either my Pre-order marketing via the numbers of Pre-orders, because Smashwords, iBooks, KOBO and nook do not provide ANY kind of info as to the numbers of Pre-orders accumulating to authors, EVER. This is very frustrating and I wish this would change. It is now two months since TCE’s release date, and I still have no figures, other than ranks on nook and KOBO, to tell me how many actual sales TCE has had. Smashwords does provide “sales” numbers, but mixes “free” or coupon-use downloads with cash sales. This is mixing apples and oranges since my ebook is only free to reviewers and a select few others. Even with a cash total, this is a net profit figure, not a gross sales total: I have to do the math myself to estimate actual cash sales numbers, something else I wish would change. iBooks sets up threshold before it puts out even a ranking that my ebook hasn’t met up to now (and neither the gate nor my sales number is known, which is frustrating; also needs to change). As a regular Kindle (KDP), not Kindle Select, author, I did not have the option to do Pre-orders on Amazon, but at least I can check in on any day, any hour and get not only several different sales and author relative ranks, but go look at my actual sales figures online, including total sales, gross cash intake and net royalties. Yeah, Amazon! Going solely by Amazon’s and Smashwords’ sales figures (the only ones I have), my Pre-Order and regular sales periods have not yet been huge successes, to say the least. I just got my first royalty checks, from Amazon (since Smashwords only pays quarterly and includes all the other vendors in one check). The total would not even pay for one tank of gas. BUT, I am now a professional, paid ebook author, nonetheless! Woohoo! 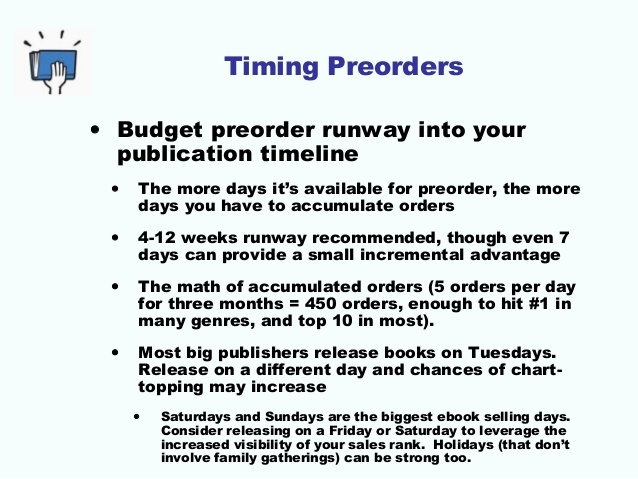 My Recommendations: Every book sales site should provide real-time and accumulated stats to authors during Pre-orders as well as regular sales updates if not hourly, then daily, with no “qualifying” threshold to become eligible to see stats. AND, please do not mix free downloads with paid sales in the figures. I tried to first gather fans (see above) and then mobilize them. However, as a first-time ebook author with no other fiction sales before this, my “fan base” is minimal even now, two months later, and nonexistent prior to Pre-orders. So, great tip, but I couldn’t use it for TCE. I plan to use my growing fan base extensively for This Changes My Family and My Life Forever, Volume II, however, which goes into Pre-Orders in April 15-18 (because of policies and schedules not in Smashwords’ control, other ebook vendor sites do not open Pre-orders on the same days as each other) and on sale June 9, 2014. I took Mark’s advice about pricing all the way. He suggested lower prices or free for Pre-orders, but strongly suggested NOT offering it free if the ebook has no others before it in the Series. Mark also suggested, based on his extensive research, the “sweet spot” balancing sales with profits for ebooks, currently is set at $3.99. So, I set TCE’s Pre-Order price at $1.99. The sales price for TCE has been $3.99 and will stay that way until Volume II goes into Pre-orders, 4/15/14, at which point Volumes I and II will both be set at $1.99. On Volume II’s release date, 6/9/14, TCMF&MLF will go up to $3.99 and Volume I will become FREE forever more, to all, as recommended for series authors. When The Spanners Series ebooks start selling well and my fan base has grown even more, I will bump up Volume II’s price to $5.99 during Volume III’s Pre-order period, November – December, 2014, making This Is/Is Not the Way I Thought Things Would Change, Volume III’s Pre-order price $2.99. Volume III’s sales price, starting in mid-December, 2014, will then probably be $5.99. If sales aren’t great (YET), I’ll follow my previous pricing plan for a while longer for upcoming Volumes (the series has 10, total). I do not believe the exact pricing made that much difference, but I really can’t tell. I also don’t know about the switch from Pre-order’s lower price to the higher sales price regarding sales impact. See Tip One: I don’t know, yet, about any sales figures, except on Smashwords, for Pre-orders, and those were not strong the first time, an understatement. Wish I could. Will do for Volumes II onward. Good tip! Yes, I plan to do it all better, as mentioned above. 1) I’m doing more about getting Beta readers for Volume II. 2) I’m turning reviewers for Volume I into reviewers for Volume II. I have more fans, I am involved in several networks of authors and others that help with promoting each others’ social media sites. 3) I now have 3 Book Trailers ( which I created myself, free, via Animoto) so that my youtube Spanners Series Channel GROWS. Each time I released a Book Trailer, my sales went UP on Amazon. Don’t know about the other sites, but my ranks did go up slightly. 4) I now have 50 more flyers and first, via KLOUT, free business cards via MOO, and when those ran out, got inexpensive ones via Vistaprint which I designed. They have my links, TCE book cover and Series logo on them. I give them out EVERYWHERE. 5) I joined and attend workshops with several local writers’ groups. 7) I use StumbleUpon, Reddit, Quora, AllExperts.com and other sites to raise the visibility of my “brand” and drive traffic to my website (via WordPress.com). My website now has over 120 #FF, which I know is still small, but it’s a 300% increase since launch date 2 months ago! 8) I set up cross-posting and opened a Tumblr website that receives all posts from my WordPress blog, so my blog posts are re-posted on Twitter, LinkedIn, Facebook, Google +, Goodreads, Shelfari, BookLikes and Amazon. 9) I use JustUnfollow to keep my Twitter #FF useful, active and not ‘bots. Now up over 2300! 10) I continue to use author networks to share and collaborate for increasing each other’s visibility, rankings and comments. All of my numbers are fairly high and staying there on the book and author sites mostly due to these efforts. So, with all the above, I am READY for the next Pre-order period much more than I was before. I hope this one ROCKS! 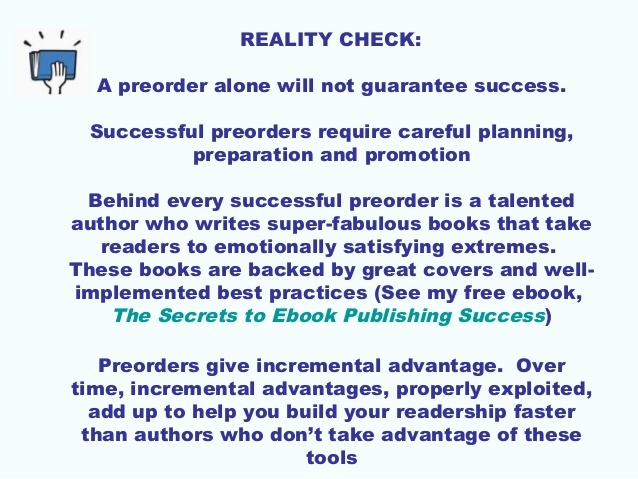 Link to Mark Coker’s full Pre-order Slide Show post here, which is well worth viewing: take notes! Please share, tweet, USE! Thanks, Mark. Next time, I’m ALL OVER IT! 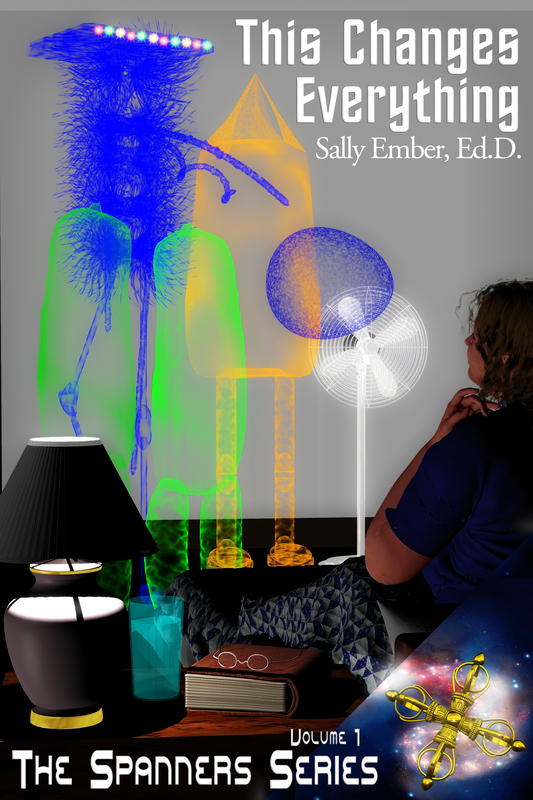 This entry was posted in Indie or Self-Publishing, Personal stories, Statistics, This Changes Everything, Volume I of The Spanners, Writing and tagged authors, ebook, indie authors, marketing, Sally Ember, self-publishing, Smashwords, Writers. Bookmark the permalink. Sally, you’ve provided great detailed information!! I’m sharing what you wrote, I think it will be extremely helpful for others… myself included! I’ve got a little experience on some of the platforms you have mentioned but there are many others I need to look into! Thank you! Thanks Sally! My progress is slower! I work on it when I can after work and when not busy with the grand kids! I do sit with the laptop in the front room with them so I manage to squeeze in some each day!! Peace!